The End Brain Cancer Initiative (EBCI) joins other organizations to honor Senator McCain’s life and fight against brain cancer. EBCI calls for National Concerted Action that Offers New Access and Treatment Availability for Brain Cancer Patients and Critical Changes to WHO & NCCN Guidelines Leading to Updated Standard of Care and Clinical Practices. 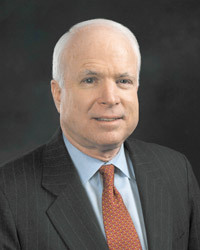 SEATTLE – AUGUST 27, 2018 – Joining with other sister charities and fellow citizens overall, The End Brain Cancer Initiative (EBCI), formerly the Chris Elliott Fund, extends its condolences to the McCain family and respectfully honors Senator John McCain’s passing and legacy of service to our country. Senator McCain faced a disease that tragically afflicts and kills many thousands of Americans every year. As an organization, EBCI is dedicated to increasing survivorship now and finding a cure for brain cancer in our lifetime. When you hear of famous people dealing with a brain cancer diagnosis, it is natural to assume they will access the best care and most advanced treatments possible irrespective of geography or current medical provider. At EBCI, we think that should be the experience of every brain cancer patient. As has been widely reported, Senator McCain suffered from a form of brain cancer called glioblastoma, the deadliest form of brain cancer that ends lives on average within 15 months in over 50% of cases. In the past few years, brain cancer has stricken other notables such as Beau Biden (son of former Vice President Joe Biden), Senator Ted Kennedy, President Jimmy Carter. In President Carter’s case it was metastasized melanoma cancer to the brain. He benefitted from immunotherapy, an important new treatment that utilizes the body’s own resources to fight and destroy cancer cells, and was declared cancer free. Currently, throughout the country there are key brain cancer specialists, centers of excellence for treating this disease, promising breakthrough treatments, and significant new clinical trials. Most brain cancer patients, though, are not informed or given access to these advanced treatments because the current standards of care are not in step with the emerging science and treatment breakthroughs. Additionally, approximately only 3% of brain cancer patients participate in clinical trials. Senator McCain’s passing has led to calls to give national attention to fighting this disease and fueling new research. Last year, his daughter, Meghan McCain, explained the disease and appealed for support for brain cancer research on The View and in other public forums. One key that has emerged in the past few years is genomic profiling. Research has shown that every cancer is unique both in its original form and as it mutates. These cancers are being carefully profiled by researchers around the world. The profiles or “biomarkers” can then lead to specific, “personalized” interventions to address this incredibly complex disease. 1) Enhance patient outcomes by expanding FDA-approved brain cancer treatment modalities. 2) Close the existing GAP from initial diagnosis to IMMEDIATE AND EXPANDED ACCESS to specialists, researchers, advanced & innovative treatments, clinical trials and critical care. 3) Improve patient outcomes through updating and improving WHO (World Health Organization) & NCCN (National Cancer Care Network) Guidelines and clinical practices related to Standard of Care for brain cancer patients. Since its founding, EBCI has helped thousands of patients, caregivers, and their families and has become a credible and trusted resource at all levels in the brain cancer treatment community from patients to research institutions to pharmaceutical and regulatory entities advocating on the National and State level for the approval and reimbursement of new therapies for cancer patients. EBCI also participates as the “Patient Voice” in clinical trial design, an example can be seen in CNS Oncology (Link to Article). EBCI supports about 900+ patients, caregivers and families, free of charge annually through its “Direct Connect” Program, and provide Education/Awareness/Outreach to over 8.7 million annually, including members of the Brain Tumor Community. EBCI is a member of the American Society of Clinical Oncology (ASCO), Society for Neuro-Oncology (SNO), American Association of Neuroscience Nurses, American Association for Cancer Research, and Life Sciences Washington, among other organizations.